I have just spent 9 days in Spokane visiting with my family and spending time with my youngest son Jason who is on spring break. I always love to spend time with them it gives me a little breather and also allows me to catch up with a lot of emails and gives me time to think about the year ahead. While in Spokane I taught at the North Idaho Quilt Guild for a couple of days. The class was full of very enthusiastic students who worked on my ‘Bird Play’ block. It is always fun to see all the embellishment techniques used by each student. We used many ribbons which were attached in many different ways. Couching was also widely used stitching with an array of hand dyed yarns. These pieces are still in progress but you can all see how the sky is the limit with creativity. I can’t wait to see them once more has been added. Don’t you love the use of zippers. Very creative! 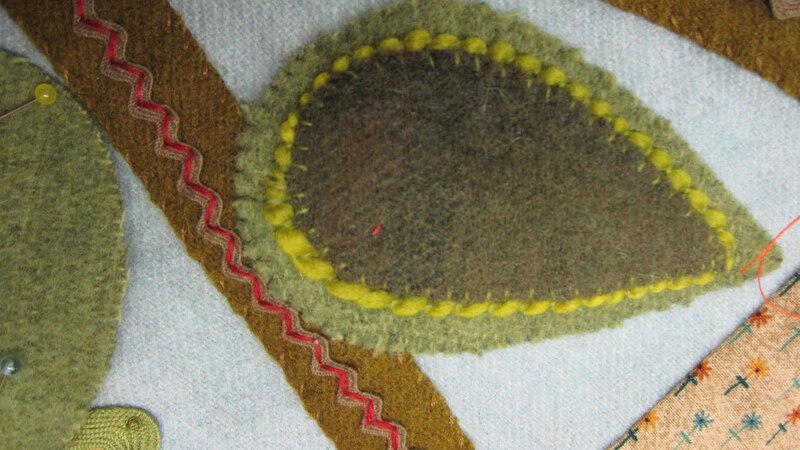 We used a combination of cotton, silk and metallic threads for stitching. It is always a surprise. 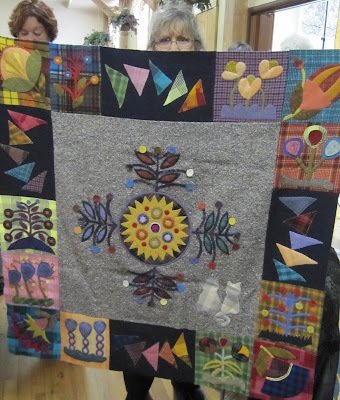 Sharon Howe has been teaching my Flowerbed Quilt as a class at Bear Paw Quilting. It was wonderful to see Carol and Eileen’s blocks in progress. Cheryl Clossin also brought her blocks from Magnolia to share. Many thanks to Sharon and all her guild members for making me feel so welcome. It was a pleasure to share my passion of wool and embellishment. I traveled to Monterey, CA last night to teach for a week at Empty Spools at Asilomar. 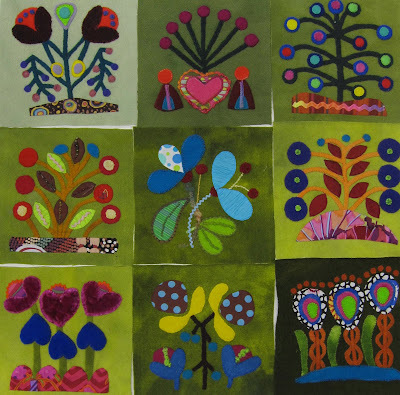 I am so excited to be teaching a 5 day workshop on ‘Creating with Wool and Textural Fabrics’. Will share my experience soon. 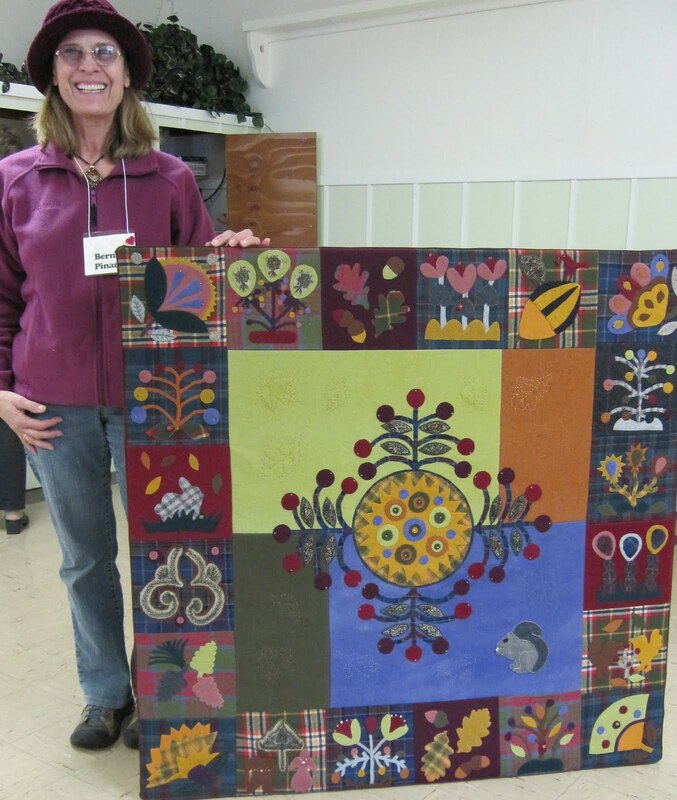 I just spent 4 wonderful days in the Medford area in Oregon at Mountain Stars Quilters Guild. I taught two full day classes and gave a lecture at the Saturday luncheon. The first class was ‘The Flower Pot’ one of my Altered Texture classes. As usual I was blown away with all the creativity in the room. Each student made creative stems and leaves using ribbons, textural embroidery threads and stitches. We then went on to layer the flowers with textural fabrics and stitches. There is never enough time in a one day workshop to work through everything. I can only touch on the technique. I am really happy I am starting to teach some 5 day workshops this year as I feel my students will really benefit for the extended length of class as we will be able to study all my techniques in great length. The second day each student chose one of my small pincushion or needle case kits to work on. Bernice retired her old needle case for this new one which she made from my ‘Sew Your Seeds’ kit. Jennifer you have started something! I am guessing everyone who comes to my classes will now have to have a cool needle case. Gerri took such good care of me while I was in Medford. She has worked on many of my patterns and I loved this version of my Greenbrier Quilt she shared with me. A couple of years ago a few of her friends got together to work on this piece. A few of them brought there pieces to share with me. I just love handwork classes. The sharing and friendship that develops throughout the day is so inspiring. I will be one of the featured quilters on Pat Sloan’s Creative Network tomorrow at 4pm. Pat airs her podcasts every Monday afternoon on her Creative Talk Network. She chats with two guests — tomorrow March 7, she is talking with me at 4pm EST and Victoria Findlay Wolfe of BumbleBeans at 4:30 pm EST. Cathy and I have just returned from a wonderful week in Indiana. We had a booth at Beth’s Winter Woolen Workshop this weekend at the Elliott House in Kokomo. We set up in a little porch room in the house along with many other vendors who love fiber especially hand dyed wool. It was really great to spend time with my friend Alice from Ali Strebel Designs as she was vending as well. 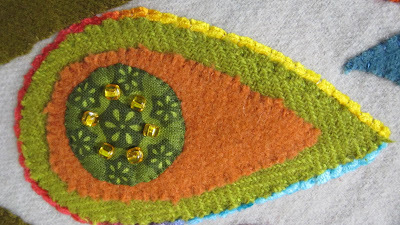 I taught a pincushion class on Saturday afternoon to 11 very enthusiastic students. We worked on the principals of working with wool and also covered some embellishment stitches. We stayed with Cathy and Roger in their lovely home and were kept busy every evening eating and stitching with Beth’s friends. It was a treat to visit with many of our customers from that area as well as a few that came down from Michigan. Cathy and I arrived home yesterday and spent the afternoon unpacking and preparing for the new week. I think it is going to be a little warmer for a few days and hopefully we will see a little sunshine this week.